When Patrick Ayres first saw the condemned 1918 house that would eventually be home to Cloverdale, he didn’t dare go in. The 31-year-old former executive sous chef of Canlis in Seattle had moved home to Steamboat Springs, Colo., to raise his kids and envisioned opening a restaurant that would cement the state on the culinary map. This place didn’t even have a functioning roof. “It was a disaster, falling apart,” he said. But other options in Steamboat were bland as stale soda crackers, so Mr. Ayres and his wife, Kaylee, ended up buying it, along with a 10.5-acre homestead that sits five miles away. Cloverdale Restaurant and Farm opened in July 2017, featuring a five- and a 10- to 14-course tasting menu. 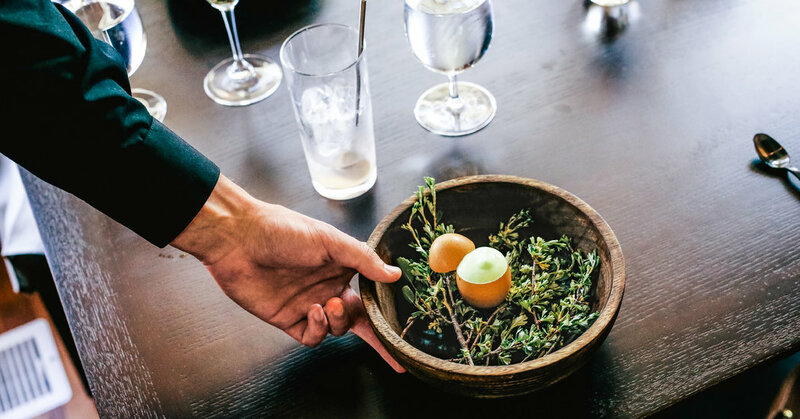 “Tasting menus are a way for us to be constantly creative, even in the middle of service,” Mr. Ayres said. They feature an array of produce, 90 percent of which is grown on the farm, with help from a master gardener; each member of the restaurant staff tends the crops at least once a week. Most new farmers face an uphill battle, but Cloverdale’s were at an elevation of 6,695 feet. Last summer, consecutive frosts in June, July and August throttled the summer squash and bush beans. The solution — installing four 75-foot low tunnels alongside their greenhouse — has worked. The restaurant is outstanding. We opted for the five-course menu at our recent dinner, though the second I tried the first dish — a savory parsnip panna cotta topped with a crumbly layer made from baked molasses and rye wheat berries, then studded with tender radish and carrot pickles cut into perfect moons — I wished I had gone for the longer option. A creamy sunchoke and chestnut soup buoyed seared striped bass, sprinkled with crispy shaved sunchoke chips. Lamb cooked sous vide was light, not gamy, served with fried sweetbreads and grilled preserved eggplants that left a faint whiff of wildfire on the plate. Before dessert — an edible Piet Mondrian painting of ceylon ice cream atop a trifecta of apple syrups — a barista arrived with saucers of Steamboat-roasted coffee beans and tea leaves to choose from arranged on a gleaming tray. Cocktails are no less carefully considered; the Mr. Tally Man — a frothy blend of pineapple rum, yellow chartreuse and crème de cacao topped with spiced banana and tonka bean-flavored whipped cream, nutmeg and a candied blood orange slice — tasted like egg nog that had smartened up and moved to Kauai. Cloverdale Restaurant and Farm, 207 9th Street; cloverdalerestaurant.com. Dinner for two, without drinks and tip, is $130 for the five-course tasting menu, or $270 for the 10- to 14-course tasting menu.